Aquarium heater is a simple device, however how many troubles you may have once it gets broken. They range from fishes boiled live to those frozen to death. To avoid this disasters, I’ve selected the best aquarium heaters and reviewed them. 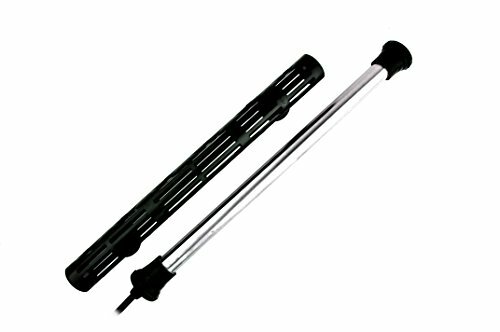 Aquarium heater is a device for maintaining tank water temperature stable and for heating tank water or air in a terrarium. This is an important component of tank or terrarium technical equipment. Tank water temperature is one of the crucial factors that influences on healthy existence of all living creatures in a tank. Temperature parameters are especially significant for tropical and thermophilic fishes, which require tank water temperature about 75-82°F (24-27C°). That’s why various aquarium heaters are used to keep optimal tank water temperature to ensure healthy and comfortable living of tank inhabitants. In winter tank water heating is especially essential, since water temperature may become lower than 68°F (20C°). Such rapid temperature change may take a toll on tank inhabitants and in some cases it can even lead to fishes death. Abrupt temperature change is harmful for tank plants as well. This is why tank water temperature has to be the same in the whole tank. In the upper water layers water is always warmer, while in the bottom layers it is several degrees colder. Recommended and acceptable difference between the bottom and upper water layers temperature shouldn’t exceed 2С°. At that tank bottom temperature should be optimal for the tank plants. 1 How to choose aquarium heater? 2 What size heater do I need? How to choose aquarium heater? When buying aquarium heater you should also get a thermometer to check how it performs. For large sized tanks it’s better to get not one high capacity heater with a thermostat, but several devices of this type. If the device is to be used in a tank with seawater, it is important to choose a device designed to heat brackish water. I’d like to include more models into my review, but I assume that this would be pointless. All the aquarium heaters are quite alike, since it’s quite hard to invent something completely new. Therefore, I’ve selected the best aquarium heater models according to their application – for large, medium and small sized tanks. This list will help you to solve the problems yo­u may face with any kind of tank (both freshwater and brackish water ones). Besides, below the list you’ll find some additional information, that will be of much help, if you don’t know which aquarium heater model to choose. Aquatop company has a very strong position on tank equipment market and it continues producing high quality and stylish devices, that can be compared with such of German (Eheim) and Japaniese (ADA) manufacturers. This year Aquatop has introduced a super small sized aquarium heater for nano tanks from 5-20 gallons (like betta tanks), its capacity is 25W. Owners of small tanks will surely like its size and ability to maintain tank water temperature stable, LED display and possibility to put the device under the water completely. This is another aquarium heater for small and medium tanks, but it is manufactured using another technology. This device is flat, made of plastic, it has an electronic thermostat which is accurate to ±0.5ºF and includes a LED that displays Set temperature range from 66ºF up to 96ºF. 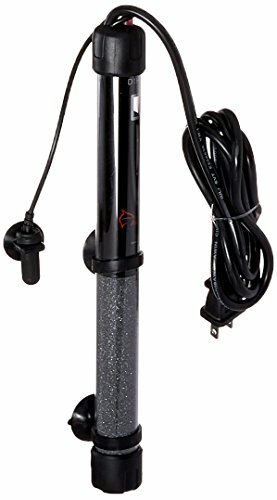 Eheim Jager 250 W (for smaller sized tanks they have Eheim Jager Submersible Aquarium Heater) – this is a heater with a thermostat. It was designed using the technologies: thermostat accuracy is 0.5° C and it adjusts from 18° to 34° C (65° to 93° F). Eheim Jager aquarium heater can be drowned into the water completely, it has an embedded overheating protection in case if it is plugged in dry or if it falls out from the water. It has a temperature control sensor and can be used for both freshwater and brackish water tanks. The heater case is made of laboratory glass which is resistant to biological, chemical and physical influences. Glass bulb of Jager aquarium heater is of improved quality, which increases the heating surface and ensures optimal and uniform spread of heat in the water. Thus, aquarium heater with capacity lower, than that of other brands, is capable of heating the same amount of water! The lab glass was designed to be used in scientific experimental laboratories; it is manufactured according to a special standard including improved security of its usage as well as its composition shouldn’t contain any admixtures that could pollute water. The glass is resistant to chemical and organic substances, it is shatterproof, it stands abrupt temperature change (for example, when getting under cold water during water renew or sharp water level change when draining water from the tank). Consider: Adjustable heat setting 68 to 88°F (Thermostat accurate to +/- 1°), it doesn’t break, can be completely drowned, it turns off when overheated and has user-friendly plug-in indication system (the red indicator is on – the device is on, the green light is on – the device is off), lifelong warranty, made in the USA. The device is available on the market with capacity from 50 to 250 Watt. I even don’t know what can be said on top of all above mentioned. Thus, this aquarium heater has no rivals yet. If you have never had large fishes in your tank (like oscars, for instance), then you don’t know that these are quite capable of breaking an aquarium heater and they do it quite frequently. You know what repercussions it may cause. 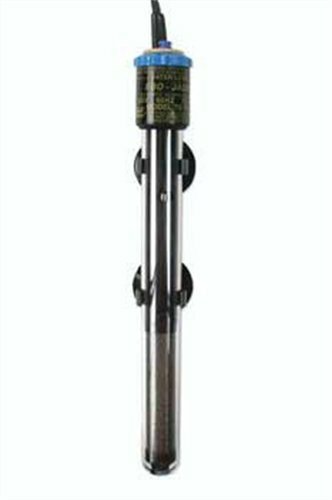 Here is a solution for this issue – Finnex Deluxe Titanium Tube is designed right for large fishes. What makes it different from analogue devices? It is made of titanium tube and covered with a special Protective Guard. Even a human has to put efforts to break it, so for fishes it is almost unbreakable. Besides, this heater is a very powerful one – from 300 to 800 W, which allows heating water in very large tanks (140-265 Gallons). It is essential to create proper environment for tank fishes, since most of them were brought from warm countries, that’s why they can live only at water temperature not lower than 25-30°C. Even if the tank is located in a warm room it still requires an aquarium heater. This is not only because the tank water should be warm, but also because its temperature has to be as stable as possible. Since some fish breeds are quite sensitive to abrupt water temperature change. Aquarium heater capacity is calculated in Watt. The manufacturers usually indicate on a heater packaging what tank size/volume the heater is made for. Aquarium heater usually consists of two parts: heating and temperature control element to keep the temperature stable. The device may or may not have a thermostat. It is applied mainly for warm water and tropical tanks. In modern aquarium husbandry electric heaters are more commonly used, they have coil heating element as a heating element. In combination with temperature control elements such heaters ensure maintaining required temperature quire precisely considering their relatively small size and low price. external heaters, their heating element is in the open air. Internal aquarium heaters are put either on a tank bottom, or in the place where there is a water flow from a tank filter or something like this. Most of the heaters have a suction cap that allows fixing the device to a glass wall of a tank or terrarium. Are aquarium heaters fully submersible? Non-submersible heaters are the devices that are put under the water only partially, i.e. just their heating element. As a rule the manufacturer indicates on the device case the maximum level till which it can be drowned. These aquarium heaters have their thermostat above the water level and you set the required temperature using it. Submersible aquarium heaters are very convenient in use since they can be put horizontally on a tank wall. Such a location is especially convenient when performing water renew – you don’t have to take the heater from the tank. When using submersible devices, first you have to unplug the heater when performing water renew. When draining water from the tank the water level will get lower and the glass tube with the heating element will stay out of water and it can just explode. Most of modern aquarium heaters are already equipped with special thermostats, which help to avoid water overheating. By means of thermostat you can set the required water temperature, which is very convenient in every day use. Also there are aquarium heaters without thermostats, they are programmed to maintain constant temperature and are more often used for small tanks, since they have low capacity. Heaters that have thermostats automatically adjust tank water temperature. You’ll just have to set the appropriate temperature. For example, when the water temperature reaches the set value, the heater turns of. Overheating is impossible when using these heaters. In case if the device becomes out of order, the heating element will turn off automatically. Ordinary aquarium heaters consist of a thermostat, contact elements and a heating spiral. Here the thermostat controls tank water temperature and if necessary it closes and opens contacts, this way it turns the heater on or off. Aquarium heater capacity is defined by the tank parameters (volume, surface square, presence of a cap or a cover-glass, the place of the tank location, type and power of light lamps etc.) and temperature difference, according which the device should heat the water. In the most general case aquarium heater capacity is defined according to the tank volume and temperature difference from the range (0,2 : 0,5 W) / (l * degree). For aquarium heaters with thermostat the relative capacity can be up to (1,0 W) / (l * degree). As a rule, to heat 1 gallon of water (from 3,79 to 4,55 liters) it requires 5 W for 1 gallon. Thus, 20 gallons tank will require 100 W capacity aquarium heater. It is not recommended to get heaters with sufficient overcapacity, since if its control or heating element becomes out of order it may cause water overheating and death of aquatic organisms. The heater is a waterproof device and it can be installed both vertically – with adjusting handle above the water surface and horizontally – completely put under the water. You mustn’t put the heater into the sand or gravels on the tank bottom. Water level should be always higher the minimal sinkage level, which is the mark MINIMUM WATER LEVEL, printed on the heater case. You should always keep in mind that water level decreases continuously due to its evaporation. The aquarium heater is fixed to the tank wall by means of a hanger with two sucking cups, which should be placed on the heater directly under its head. The heater has to be mounted in some place in the tank with uniform and continuous water flow. ATTENTION! Only 15 minutes later after installing aquarium heater in the tank, when the temperature of bimetal switcher of the heater becomes the same as the one of the tank water – this is when you can plug in your aquarium heater. Make sure that the heater doesn’t touch sand or gravel on the tank bottom. Aquarium heater should be mounted only vertically or horizontally, but if you have chosen the latter variant you should place the device on a tank bottom. To avoid the device overheating and insure its better performance, it’s better to put it close to the tank filter. In this case the device will be constantly washed with the water flow. Place the aquarium heater so, that on the chosen height the water level never gets lower than the “minimum” mark. Owners of large sized tanks should be aware that the heating device shouldn’t be placed deeper than 90–95 cm from the surface. Don’t plug in the aquarium heater if it’s not completely drown into the water. After putting the heater into the tank, wait for 15–20 minutes till the device case temperature becomes the same as the tank water temperature. Only after this you can turn it on. Don’t turn on aquarium heater if it’s out of service. You should unplug your aquarium heater (no matter if it is a common one or the one with a thermostat) when taking it out or putting it into the tank. It is important to keep in mind, that while the device is operating you mustn’t put your hands into the tank or touch its walls.